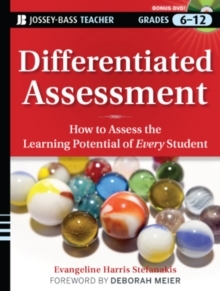 A comprehensive assessment system for working with underperforming students This book describes a comprehensive assessment system especially appropriate for multilingual and "differentiated" classrooms with large numbers of underperforming students. Drawing from Multiple Intelligences theory, the approach is specifically aimed at helping teachers understand how each student learns and how best to tailor instruction to serve individual students' needs. Although the program makes use of conventional standardized tests and disability screenings, it places special importance on two approaches in particular: Student Portfolio Assessments and Personalized Learning Profiles. * Provides detailed guidance and practical tools (including a DVD) for implementing successful portfolio and "profile" practices in the classroom * Includes real-world examples of model assessment programs from five schools * Explains how to integrate assessment into the instructional process as well as how the portfolio program can be used Formal profiles provide vital information about each student's cultural background, interests, strengths, and capabilities as well as their individual learning and language needs.